It was two springs ago. The rain wouldn’t stop. It fell in thundering sheets, pooling in farmfields and backyards. Water ponded in basements, sneaking in while the world slumbered. This is the way of storms: The sky can stand calm above you one hour, and then scream with rage the next. Yes, skies and mortals weep. “Jennifer,” my husband called up the stairs. “You’ll need to come down here.” I could hear the sadness in his voice. 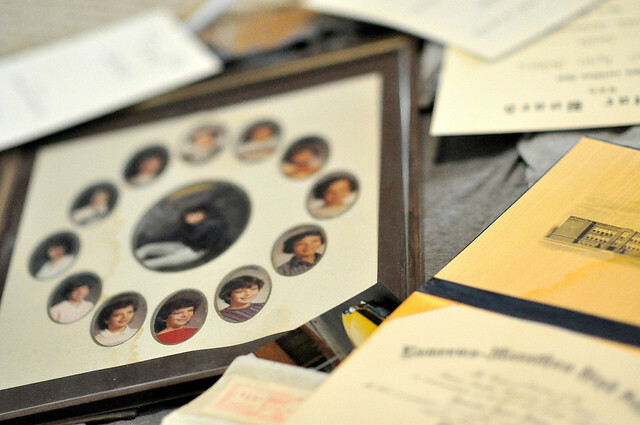 At the bottom of the steps, he held out a soggy cardboard box, labeled: “Jennifer’s childhood memories.” I had meant for years to put that stuff in plastic bins, but hadn’t gotten around to it. I closed my eyes, and let my air out in one long exhale. The storm was indifferent to what I held dear, and the water had soaked straight through the cardboard. Through tears, I pulled 40 years of memories out of the box, laying it all before a whirring fan, praying I could save most of it. This is what that box held: My baptism certificate. My high school diploma. The first news story I ever wrote, at age 15. My baby book. First tooth. First snip of hair. Every school photograph, kindergarten through senior year. I cried with the sky, cried over all of my wet stuff. And yes, it was just stuff. It will be stained, is all. Above us and around us – and sometimes even inside of us – thunderheads are building. Out of nowhere, it seems, storms spill from the torn fabric of an iron-gray sky. Or maybe from behind the closed doors of the doctor’s office, or on the other end of the phone line, or right at your own front door. Reading those words, you might be inclined to keep your doors locked, your phone off the hook. You might avoid getting too close to someone who wants to love you because you never know when the storm will come, sweeping away your joy in a torrent. Except that there’s more to that Bible verse. That verse doesn’t end in trouble. It ends in power. The day after the storm seeped into our basement, staining a box full of memories, the creeks bulged and raged. And a few miles away from our front door, a teenage boy fell into Beaver Creek. The boy’s friends went for help and found a man named John Lems, a retired firefighter. Later, John told local TV news reporters that he thought about throwing that boy a rope. But if the boy grabbed for the rope, he would have had to let go of the tree that was keeping him from going under fifteen feet of rushing water. John told me that he knew that the boy was scared, and that the river was awfully cold, but he could see that the boy was strong. And he would need to just. hang. on. And so that boy hung on to the tree. And he kept hanging on until the rescuers arrived. When trouble comes – and trouble will come — when the river through your life swells and rages; or when the creek-bed cracks dry; when the storm marches across the sky, or maybe straight across your heart; you will be scared. And it might feel cold. You might be tempted to grab for a sorry substitute, begging for the false hope of a rope. But friend, you are strong. Hang on to the Tree that is even stronger. Hold tight to the tree that has already redeemed you, the tree that bore every ache you could fathom, the tree onto which every sin was nailed. Hold on to the tree that held your Savior. 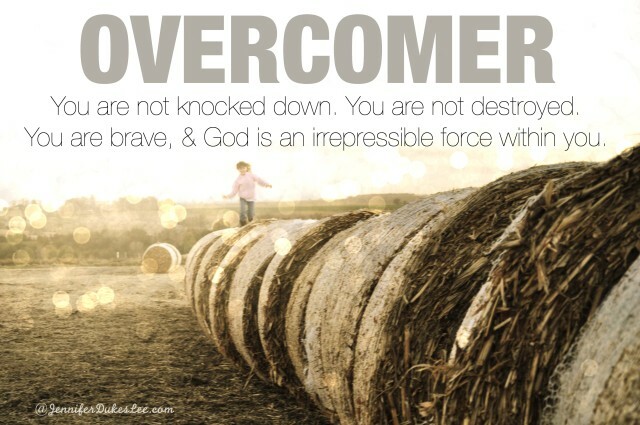 You are an overcomer. You may be storm-stained, weary from the battle. But you know what? You are not knocked down. You are not destroyed. You are brave, and our God is an irrepressible force within you. There’s nothing on earth that can uproot that tree or snap the Savior’s promise for you. Don’t let go. You’ve already been rescued. The world and all its storms have already been overcome. And when the storm passes by, you’ll find that the Calvary tree held firm. The heaving dark will have given way, at last, to the sun. And you’ll know for sure, that the light has won. Hey Tell His Story crew! It’s always a joy to gather here every week. You’re welcome to link up below. If you would use the badge on your blog, that would be great. And if you would visit at least one other blogger in the link-up and encourage them with a comment, that would be beautiful! You guys are the best. Be sure to check the sidebar later this week. I’ll be featuring one of you over there! Amen! It’s so easy to seek the easy way out–but so much more satisfying to cling to the cross and just hang on while the storm roils around us. Great point, Anita. Thanks so much for sharing. Beautiful post, Jennifer. Today may we have eyes which see those who need to hear, “Hang on to the Tree!” May we all be that voice to others today. Blessings! Thank you, Joanne. That’s a very powerful quote. Jennifer- It is always a delight to read your words- the ease and beauty of your writing sets the stage for valuable lessons to be learned (as a writer and a daughter of the King). Thank you. Jennifer, there is so much power in these words and I know it’s proven true in my life. Even when I couldn’t see Him, I held on and his strength pulled me through. It reminds me of Jeremy Camp’s song, He Knows. He knows our suffering and our needs and will carry us. LOVE Jeremy Camp. Thanks, Abby. Beautiful hope here, Jennifer. Beautiful truth. It reminds me that in reality, our firm grasp upon the savior is weak in comparison to His eternal grip upon us. He never lets go. Thank you that in this story you share such promise. So grateful for your wisdom in the comment box today! Absolute truth here Jennifer. Thank you for sharing the hope we have in the One who has already one the victory. The hope that carries us through inevitable troubles. Blessings! Thank you, Deb. Glad to have you here in the comment box today. Me, too, friend. So thankful I’m not destroyed. Hang on to the Tree. Yes. You’ve nailed it, Jennifer. Because troubles have come and will continue to come and we can’t avoid them all, but we can cling to the One who will stay with us through it all. I love this story about John and the boy. Thanks for sharing. So happy to have you here, Lisa. God bless. Love the beauty in this! Just what we need to remember when the storms come raging and we feel like all is lost. Wow – took quite a bit of wisdom and courage even for John to relent on throwing the rope. 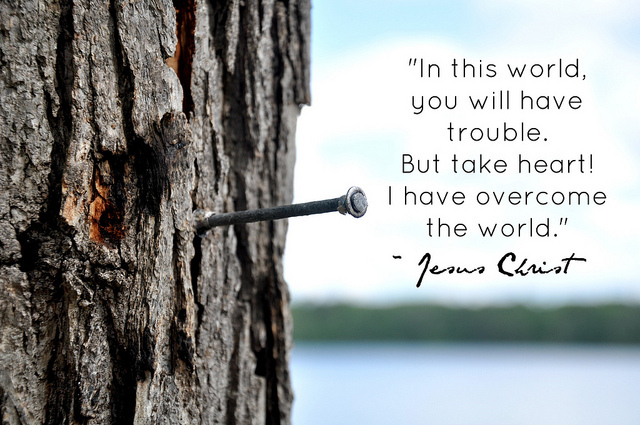 Holding on to our good and constant Savior with you, Jennifer. His grace and love upon you in great measure – and JOY this Wednesday! Good point, Ginger — about John not throwing the rope! Thanks for being here. “You’ve already been rescued.” Words carry a weary soul. Bless you, Jenny. Thanks for being here. You have such a beautiful way of bringing truth to our lives. I have hung onto the tree until there are splinters in my hands. And yes, the Son broke through the darkness! Thank you for this! I love this truth-filled story, and I would have cried buckets over those boxes of memorabilia. Thankfully, everything was just stained … not destroyed. All was salvaged. Can’t wait to read your post! I heard a lot of talk about it on Twitter today! Bless you, friend. Love you. Thanks, Kris. I actually wrote this one for Ann Voskamp’s blog about two years ago, and realized that I had never published it on my own blog. I love you so… and I will always be close by to shout, “Hang on to that Tree, friend!” Yes, because He’s got a hold of you and He will not let go! Beautiful truth. Just hang on to the tree. Jesus has got this. We will overcome!!! Overcomers because of Him – yes! Wow, Jennifer. You write such hope, with beauty and power. Thank you. I’m sorry your things were soiled and stained. I’m glad they were not completely destroyed. Your writing is so engaging. I fall right into the story with you. Funny how God places stories on our hearts to tell. My story this week was about ranging waters, as well. Your words very much touched my heart today, Jennifer. “You’ve already been rescued.” It can be easy to forget that when we are in the midst of heartache – to remember that God has already delivered us out of those broken places – in His eyes, it is finished. Thank you for the reminder and for hostessing this lovely place for us to share our hearts. Many blessings. I just wrote about our own time of trouble, and how I developed a fear and evil foreboding mindset from it, and how God helped me to change that. I so love your reminder to cling to the cross! Holding on to Him through all the storms, Jennifer! I can never read your posts without feeling the wings of hope soaring in my heart. Blessings to you! Beautiful story, Jennifer, of His restoration & renewal. Thanks for hosting & God bless!